A trio of bloody kittens are starving and their favorite meal is dying. Will they get fed? When it comes to the carnal outpouring that flows through Dub Trio’s new album Another Sound Is Dying, beauty is in the eye of the bulldozer. Over the course of the 14 tracks there is constant regeneration, a cycling of death and life, a rebirth that is only hinted at by the album’s subtext and dub-inspired title. And whatever the blood-soaked kittens are clawing at and whatever is dripping from their mouths on the album’s cover is only a hint at the melodic mayhem that pours forth from the band’s second studio release. All the meaty metal hooks and gritty, grinding riffs sonically do imply decay, but swirling underneath the bedrock of melodic metal, dub, jazz and rock is a fully accessible series of songs, (most of which are instrumental, save for the Mike Patton guest appearance on “No Flag”) that evoke a sense of hope as much as a sense of death. It’s apocalyptic at first but when it's all over it leans towards sublime. And what Dub Trio delivers -- and delivered on previous release -- is the same savage meal those nasty trio of kittens on the cover are trying to get at. They seem to have had a taste already and they’re hungry for more of the rock, metal, and dub-drenched rhythms. The rhythmic havoc is driven by the versatile drumming of Joe Tomino, who infuses the dub/rock/metal blend with percolating jazz tempos played in a rock context. He also adds flares of psychedelia and heavy doses of improvisational experimentation, taking what we’ve come to know as dub (a splitting and doubling up on of reggae rhythms) into new territory by turning the rhythms inside out and slicing them up. Tomino’s jazz-influenced drumming is only one-third of the reason why the album purrs and growls. Bassist Stu Brooks and guitarist D.P. Holmes have both collaborated across music genres of rock, hip hop, and reggae via session work so when the trio stepped into the studio to record Another Sound Is Dying in one week the stage was set to evoke a sound rooted in the Tenor Saw’s 1985 track “Ring the Alarm”. But the ultimate plan was to unload the fury that those kittens are clawing at. In their press release, the group explains that Another is their most expansive album so far, which is true, and the experiment “to create more breathing room” works well on several levels. Their live albums -- Cool Out and Coexist (2007) and their debut, Exploring the Dangers (2004) -- both capture their ability to rumble your members live. 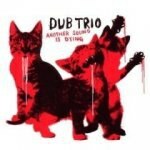 And the fact that Dub Trio never records with a vocal mic is a testament to how well they pull of a production of mixing the mayhem of metal guitars with pounding jazz/rock drumming and bass to birth sub-melodies that are usually the job of a lead singer, if they had one. All the chaos is somehow orchestrated by producer/engineer Joel Hamilton, ultimately creating a lead vocal element, making actual vocals completely unnecessary. And in the heart of those orchestrations of empty space following a tumult of erupting metal lies the expansive aesthetic beauty of Another Sound Is Dying. Adding to the depth and dynamics of the album, there’s the multiple sequences of brutal versus gentle, an onslaught of all three members wailing away followed by a gentle lingering guitar and softly popping snare and simmering hi-hat that sonically glimmers like a new dawn sunrise after a severe storm the night before. And then the cycle begins again and repeats itself, but because of the improvisational feel of the album and speed of recording, the cycle and underlying patterns syncopate and never get boring. The way Dub Trio utilize dub as a starting point and a foundation is alluring by itself, but, again, the avenues they explore and how they methodically incorporate trance-inducing melodies makes this a prime blueprint for anyone who wants to attempt creating a new sound. When it comes to recent (mostly) instrumental albums like Another, I was reminded of last year’s Battles’ gem, aptly titled Mirrored that, like Another Sound Is Dying, lacks vocals but still -- mostly on the strength of driving and heart-slaying instrumentals -- took me to a place of deep emotional and rhythmic outpouring over the course of an album. Indeed, the fantastic subtext of this album (a huge reason why it resonated so much) is that Dub Trio is celebrating dub in their own way and in the process attempting to redefine the genre by reinterpreting how raw human emotions like sadness, rage, and joy can be fodder for musical expression through the culmination of three sets of eyes, ears, limbs, and courageous souls.